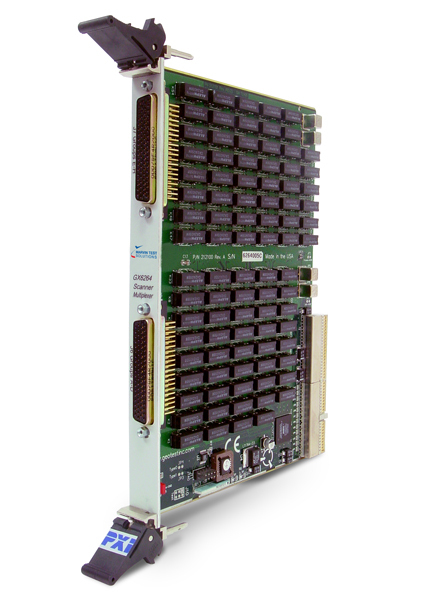 PXI Switching, Scanner / Multiplexer Card - GX6264 | Marvin Test Solutions, Inc. The GX6264 is a 6U PXI scanner / multiplexer that plugs directly into an PXI or CompactPCI backplane. The GX6264 provides either differential or single-ended scanning capability, configurable via software commands or DIP switches. The GX6264 is available in two versions: commercial and high reliability (Hi-REL). The commercial version includes plastic molded DIP reed relays and is suitable for most commercial applications. The Hi-REL version uses quasi-military relays and is suitable for industrial and military applications. The GX6264 can operate in three modes: direct switching, universal bus switching, or combination switching mode. In the direct mode, the GX6264 can route each scan group directly to a dedicated bus without routing through additional relays. This mode is differential only. The GX6264 includes four universal buses, X0, Y0, X1 and Y1, which are accessible by each of the eight scanning groups in universal switching bus mode. Each scan group can be utilized in either differential or single-ended mode, extending its scanning and multiplexing capability to sixteen channels per group. Since the eight scanning groups are independent, they can be used for either scanning to a direct bus or the universal bus. Connector 78-pin D-Type male connectors. Includes two mating connectors with crimp pins. 78-pin D-Type male connectors. Includes two mating connectors with crimp pins.